The son of Parliament attack convict Mohammad Afzal Guru, who excelled in the Jammu and Kashmir board examinations, securing a 95 per cent in Std X examinations, said that he was not aware of the crime committed by his father till he was hanged three years ago. “For 13 years, I did not know what Abu (father) was in jail. When I used to visit him, I thought he might have killed someone due to personal rivalry or something like that as we see in popular crime shows like CID and Crime Patrol,” Ghalib Guru, who was just 10 months old when the Parliament attack took place, told reporters at his Sopore home. Ghalib secured an impressive 95 per cent, bagging 19th position, in the standard X board examination for which results were declared on Sunday. The boy, who will turn 15 next month, said he came to know from the media reports that his father was involved in the attack on the Parliament and was hanged for it on February 9, 2013. “Whether true or not (charges against his father), it ignited a fire in my head. I thought if all those who carried out the attack were killed, how was my father alive? How can he be involved,” he said. Ghalib said later he understood that the charge against his father was about planning the attack. With a smiling face, the boy said he had to deal with “tensions” at an age he ought to have been playing with toys. “If I had (access to) sedatives those days, I would have tried it,” he said. Ghalib credits his father for showing him the way to deal with adversity and confusion in life. “My father used to tell me to pray ... that is what I do. It gives me satisfaction and peace,” he added. On his future plans, Ghalib said his mother, who has singlehandedly raised him, wants him to be a nuerologist or a cardiologist but his father wanted him to be an Islamic scholar. 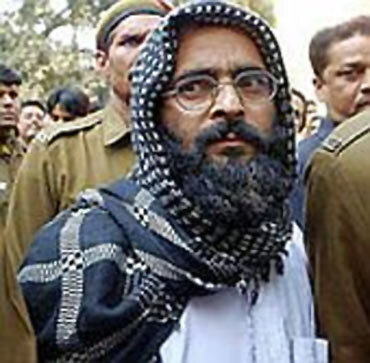 Afzal Guru was hanged to death on February 9 in 2013 following his conviction in the Parliament attack case.